Photo: Snake River Farms Kobe-Style Gold Grade Manhattan Filet. Unless you’ve been in a food coma for many years, you’ve likely heard of Kobe, the ultra-premium beef named after the capital city in Japan’s Hyogo prefecture. 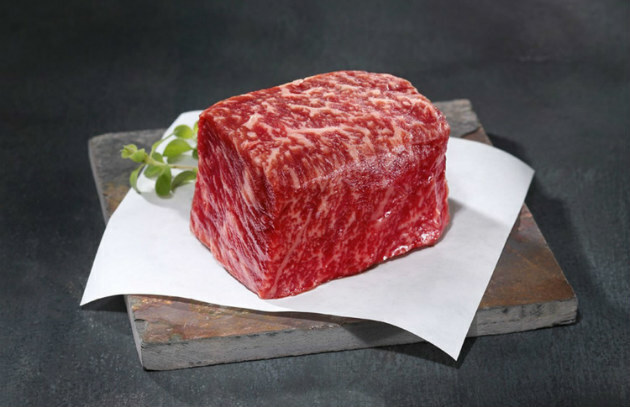 Kobe beef is renowned for its outrageous tracery of white intramuscular fat (called shimofuri, or “beautiful snow”), unctuous, buttery texture, and complex umami flavors. When raw, it resembles nothing so much as a red or pink tablecloth overlaid with delicate white lace. Adding to its mystique are those rumors, largely unfounded, producers say, of sake massages and diets supplemented with beer. If you’re one of the privileged few who has eaten genuine Kobe beef from the Tajima-gyu breed (NBA player Kobe Bryant’s parents famously named him after the delicacy), you’ll probably never forget the experience. You’ll remember how it literally—not metaphorically—melted in your mouth, its rich beefiness sending you into throes of carnivorous bliss. Unfortunately, many people only think they have tasted Kobe beef. It’s very difficult to get, even in Japan, as it comprises only .06 percent of the country’s supply of edible beef. The truth is, for the majority of the past 15 years (2001 to 2006 and 2010 to 2013) zero Kobe beef—not a mignon—was exported from Japan to the U.S. due to concerns over mad cow disease. Even now, according to Larry Olmsted, a Barbecue University alumnus who wrote several articles on the subject for Forbes, only a miniscule amount of this shockingly expensive meat (a pound can cost $250 or more) ever makes its way to American shores. Most goes to distributors and high-profile restaurants. In the mid-1970s, four Wagyu bulls (the word Wagyu simply means “Japanese cow”) were gifted to a Hawaiian by the Japanese Emperor and mated with U.S.-bred Angus cows, the beginning of a new bovine gene pool. One of the pioneers in this endeavor was Snake River Farms (SRF) of Boise, Idaho. This family-owned company, founded in 1968, strategically adopted the best features of Japanese animal husbandry and combined them with the ingenuity and experience of Western cattle ranchers. Positioning its products in the spectrum of premium beef has been one of the company’s challenges. The term “prime,” as it turns out, doesn’t do American Wagyu beef justice. Only about 3 percent of beef carcasses meet the highest USDA standard for prime, the top grade of meat sold to the public in the U.S. The grading system is primarily based on marbling. (Although other factors come into play, too.) A prime steak might contain 8 to 11 percent fat. The Japanese grading system is more finely calibrated and assigns Beef Marble Scores (BMS) to the carcasses on a scale of 3 to 12. To score a 3, for example, a minimum of 21 percent intramuscular fat is required. Snake River Farms has adopted the Japanese scale, and now uniquely offers what they call their “Gold Grade”. It features beef with a BMS rating of 9 to 12. There are currently a dozen products in this elite category including filets, strip steaks, brisket, flat iron steaks, etc. They’re pricy, but cost significantly less than Kobe beef from Japan. The abundant intramuscular fat (it’s mostly monounsaturated—the good kind) is so soft and luscious that it liquefies at 77 degrees. It literally melts in your mouth. This creates challenges for the cook, of course. Keep the meat refrigerated until ready to grill or barbecue. Do not let it come to room temperature. Lightly coat the meat with extra virgin olive oil and season simply with coarse salt (kosher or sea) and freshly ground black pepper. Use a reliable meat thermometer—an instant-read thermometer for steaks and a remote unit for roasts and other thicker cuts. Use the reverse-sear method to cook steaks and roasts. Do not exceed an internal temperature of 125 degrees unless cooking brisket. Brisket should be cooked low and slow to 195 degrees. Let the meat rest for a few minutes before serving. Melt a small amount of beef tallow (available from SRF) for spooning over the meat once it comes off the grill. Because sometimes too much is not enough!